Spain has seen one of the biggest reductions in unemployment levels in 2018, with 470,000 new jobs created between April and June. Since 2013, unemployment has fallen from 24.8% to 17.4%. At the most basic level, there is little point in having high wealth, good services or a beautiful natural environment without the freedom to enjoy them. To be truly prosperous, individuals must have control over their lives and the ability to make decisions about what is best for them that are as free as possible from external constraints. Personal Freedom as defined here has two distinct but complementary parts. First, we consider the classic liberty of individuals from state oppression: does the law protect the rights of people to life, liberty, property and the pursuit of happiness, and is the law upheld? Second, we analyse societal attitudes: is difference accepted and are people free to live their lives without hostility or undue social pressure? The Prosperity Index reflects these questions, incorporating the separate dimensions into its measures. First, it asks about the level of basic legal rights in a country, accounting for factors such as freedom of association and expression, and press freedoms. Second, it explores the extent to which citizens have individual liberties, measuring areas such as LGBT rights and religious freedoms. Last, it accounts for social tolerance, in order to account for informal societal constraints on Personal Freedom; analysing items such as the tolerance of ethnic minorities, the LGBT community and social restrictions on practising religion. In each case, the principle remains the same: is an individual able to live their life unconstrained by external forces and able to make choices that maximise their happiness and wellbeing? With the majority of nations exhibiting a rise in score in 2016-17, Personal Freedom reached its strongest point in the history of the Prosperity Index, contributing significantly to growth in overall global prosperity. This was driven by many different factors, with gains concentrated in Asia, Sub-Saharan Africa, and Latin America and the Caribbean. It is also worth noting that Iraq, despite ongoing conflict, has improved its Personal Freedom score significantly in the last five years. But despite this positive global picture, several regions saw decreased performances, including North America and parts of Western and Eastern Europe. In these cases, a decline in social tolerance appeared to be the driving factor. 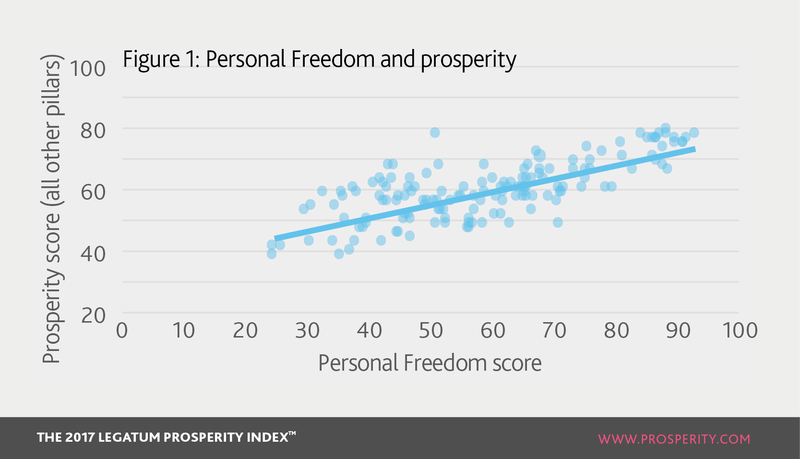 Personal Freedom also supports other pillars of the Prosperity Index. Individual liberty, embedded in both a country’s legal system and its culture, is a necessary condition of sustained prosperity. The most basic natural right, freedom of thought, is the foundation of all creativity and innovation; the rights to speak, to associate and to live one’s life as one wishes are essential to the development of a healthy society. In short, free societies are much better positioned to make use of their stocks of human capital, more likely to safeguard the preconditions for economic success, and more likely to be cohesive, strong and unified. Personal Freedom on its own does not create prosperity, but is best seen as both necessary for it to exist and a strong contributor to the conditions which allow it to flourish. This relationship between overall prosperity and personal freedom is strong, but indirect. In our 2014 report, we explored this relationship in detail, noting that all different types of freedom had significant impacts on prosperity, with economic freedom being most impactful, followed by freedom of choice and then tolerance. It noted that the relationship between freedom of choice and prosperity was stronger for those countries at the top of the income distribution, suggesting that economic freedom can help stimulate prosperity which, when gained, stimulates demand for other freedoms. This explains the fact that, as we have reported in the Prosperity Index in recent years, it is possible for countries like Singapore to shoot ahead in the other pillars, particularly Economic Quality, while Personal Freedom lags behind. However, as the country solidifies its economic gains, we could see the lack of Personal Freedom begin to constrain the growth of further prosperity. Personal Freedom on its own does not create prosperity, but is best seen as both necessary for it to exist and a strong contributor to the conditions which allow it to flourish. In Eastern Europe, Personal Freedom has been in gradual decline over the past 10 years. In both North America and the Middle East and North Africa (MENA), however, it fell recently after a sustained period of increase. This suggests that, at least in some regions, 2016-17 represents a change of direction away from liberty. Where Personal Freedom has declined, the key driver appears to be the growing intolerance towards immigrants and ethnic minorities, combined with increasing social pressure on practising religion. This reflects the heightened awareness of terrorism in the United States and Western Europe, the turmoil of war in Syria and Iraq and the refugee crisis, which has overwhelmed the MENA region and brought large numbers of migrants to Europe. It also reflects economic anxiety and paucity of opportunity, which is frequently associated with hostility to immigration, as families and individuals seek to look after themselves and their loved ones first. The extent of hostility towards foreigners is revealed in polling. According to the Pew Research Centre, in 2016, 59% of Europeans thought that more refugees would lead to more terrorism.1 YouGov polling found that 52% of Italians, 47% of French and 44% of German respondents agreed that ‘there are so many foreigners living round here, it doesn’t feel like home anymore’.2 There have also been several examples of policies which target specific groups, such as the case of US immigration restrictions against some Muslim-majority countries. Other nations such as France and Greece have seen widespread protests against refugees and migrants, suggesting an environment that is less welcoming to immigrants and a society with questions to answer about how it accommodates this sentiment whilst meeting its humanitarian duty to refugees. There is a sense that Personal Freedom is improving worldwide. Sadly, though, this is not mirrored in other pillars of the Index, most notably Safety and Security. Many countries, particularly in the West, may be willing to constrain Personal Freedom in exchange for better security, or at least, the impression of better security. When the cultural integrity of a country becomes involved in anxiety around security, political responses can significantly erode freedom. There is some indication that this has happened in Western Europe and North America, where reduced satisfaction with current levels of freedom has been one of the drivers behind lower recorded Personal Freedom in countries such as France, Greece, the United Kingdom, and the United States. It is also in these two regions that there is a correlation between declines in Safety and Security and Personal Freedom. This suggests that greater perceived exposure to geopolitical threats, either directly through terrorism in the case of France, the United Kingdom, and the United States or due to substantial refugee flows in the case of Greece, is linked with declining Personal Freedom. In practice this can take many forms, from legislation increasing surveillance passed in the United Kingdom, to debates about whether the government should be able to access encrypted communications in France and Germany. What is clear is that in response to increased insecurity, laws and regulations that restrict individuals’ freedom and privacy without violating their basic legal rights appear to be on the rise. This is the case in some parts of Western Europe, but is not universal; Cyprus was an exception, seeing the greatest gains in Personal Freedom in Western Europe this year, driven primarily by a reduction in the length of compulsory military service from 24 to 14 months. Despite these exceptions, the pattern we have seen elsewhere in Western Europe and North America would explain the reduced satisfaction with levels of freedom in these countries and reflects the tension governments face when balancing freedom and security. In an increasingly uncertain world, and with public opinion seeming to welcome more robust measures to combat terror, politicians will reach easily for measures that erode liberty. This may be the right approach, at least in the short term; but in the longer term, it risks eroding the foundations of prosperity. On the one hand, it is welcome that freedoms are being strengthened on the whole across Asia and Sub-Saharan Africa. It suggests that worldwide more people are able to live freely. The fulfilment of this ideal is at the foundation of prosperity. However, as we have seen, geopolitical trends – of increased migration and increased insecurity – threaten the continued growth of Personal Freedom. There are no clear or easy answers, but how governments manage the trade-off between security and personal freedoms will have implications for prosperity for decades to come. The largest risers this year were Portugal and Cyprus, whereas Greece is the biggest faller. Norway is the world’s top-ranked country.